Understanding the condition and ultimately finding out 'How to get rid of Unwanted Tattoos'. Choosing a tattoo design is a big commitment and as the years go by, our style and tastes can change, meaning you might be left regretting your tattoo. WHY DO PEOPLE WANT TO REMOVE THEIR TATTOOS? According to a recent poll, almost a quarter (23%) of people regret getting their tattoo. Common reasons include the design being poorly executed, a change in personal taste, or having the name of a partner tattooed who is no longer on the scene. CAN TATTOOS BE REMOVED COMPLETELY? When your skin is tattooed, ink is injected deep into the dermis (the lower layers of the skin). The particles making up the ink are quite large, so once they have been injected they cannot be broken down by your body easily and are effectively permanent. This means it is very difficult to remove tattoos without causing trauma to the surrounding tissue. The only way to guarantee complete and absolute removal of a tattoo is via surgical excision. Laser removal is also very effective, but it is possible there may be a small amount of pigment left behind. Having a tattoo removed is not a quick process and takes a lot of time and investment. Be careful when choosing a provider for this treatment; always ensure it is being carried out by a regulated clinic or practitioner, in a safe, sterile environment. Cheaper alternatives might seem like a good deal at the time, but could result in infection or scarring. At sk:n, professional laser tattoo removal starts at £164 for a four-treatment course. There are a number of tattoo removal creams available to buy online. As they are usually administered without the advice of a medical practitioner, they can lead to burning, swelling, itching, scabbing, discolouration, infection and permanent scarring. 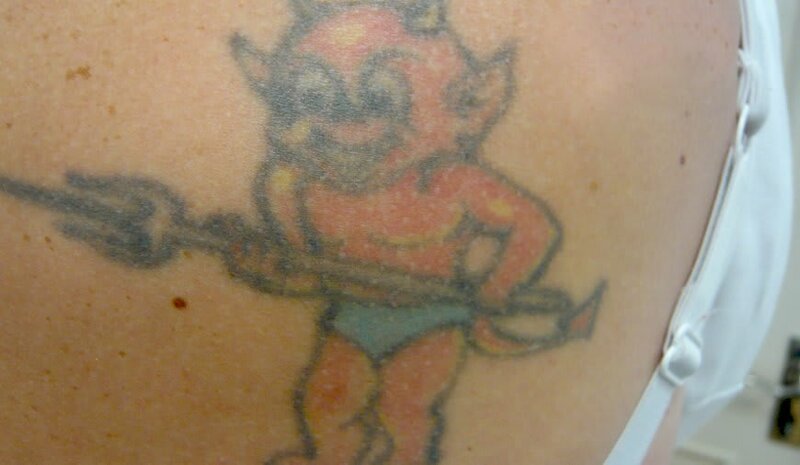 Although they might be appropriate for some tattoos, they are not necessarily the safest removal option so professional advice should be sought before using. Dermabrasion involves using an abrasive device to blast the surface of the skin in order to break down the tattoo and remove the top layers of skin. A local anaesthetic is usually administered as this is a painful method of removal. Salabrasion works in a similar way to dermabrasion, but involves applying water and salt in addition to an abrasive device in order to lift and remove layers of skin. Lasers remove tattoos by penetrating the skin and breaking up the ink into tiny particles. After several treatments (with regular intervals between sessions), the body breaks down and removes the pigment in the tattoo, causing it to fade. Unfortunately, no method of tattoo removal is completely pain-free. Laser tattoo removal has been likened to the feeling of having a rubber band repeatedly snapped against the skin. Others describe it as a rapid succession of sharp pinpricks, or a warm, prickly sensation. Because a lot of energy is needed in order for the laser to break up the ink particles under your skin, this treatment can be uncomfortable for some people. Your skin will also need 6 – 12 weeks to recover between treatments. How long will it take to remove my tattoo with lasers? A course of 6-10 treatments is often enough to remove the tattoo, depending on the colour and depth of the tattoo ink. Surgical excision involves a doctor cutting the tattooed area of skin out with a scalpel whilst you are under a local anaesthetic. Why would you have a tattoo surgically removed? Sometimes a certain ink colour will prove more resistant to laser treatment, or an individual may decide in consultation with their doctor that if the tattoo is small, and in a relatively fleshy location (such as the top of the arm) that surgical excision could work better than multiple treatments of a laser.